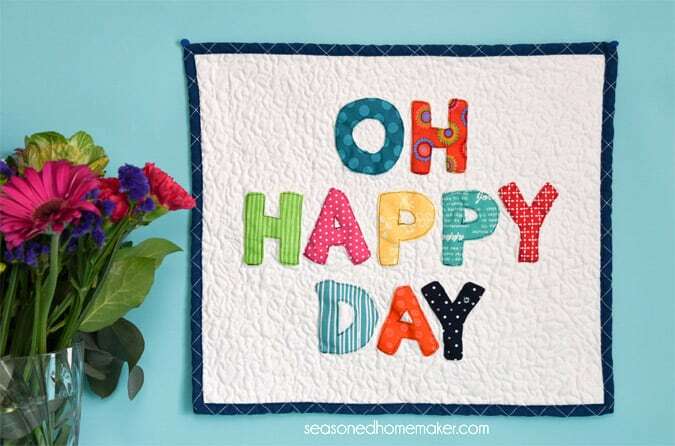 If you regularly haunt Pinterest you may have seen a lot of quilts with letters and sayings on them. I am totally in love with them and thought you might want to see how easy it is to express a thought or say something clever on a quilt. Whenever you’re making any appliqué lettering, the font you choose makes a difference. The font can be a little wonky like the one below, but it should never be full of script-y flourishes. You can take cursive fonts and enlarge them as long as they are simple. 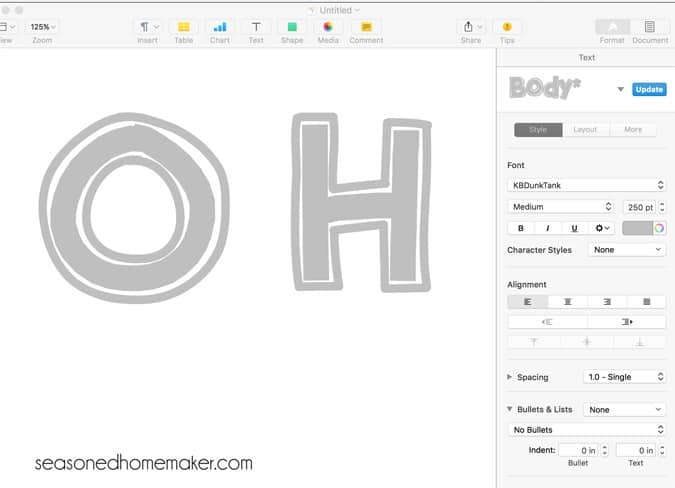 Be sure to tape the letters together to form the word before you trace. 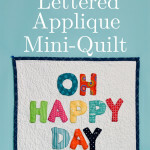 For this project I created a mini quilt with simple letter appliqué. Follow along as I go through the steps below. For my project I chose the free KB Dunk Tank font and increased the size to 250 pt. Keep in mind for this project you only need to print out these letters: O, H, A, P, D, and Y once. Print out your letters. On the paperback side of a fusible web product like Heat ‘n Bond Lite, trace your letters. Be sure the letters D, P, and A or traced backwards! 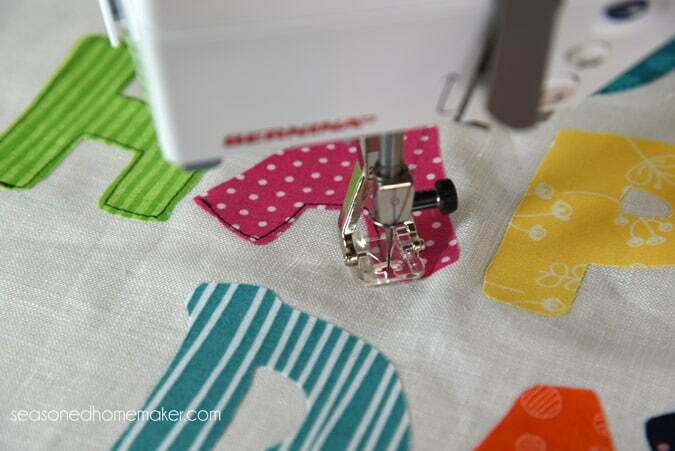 Press the fusible side of your letters onto the wrong side of your fabric. 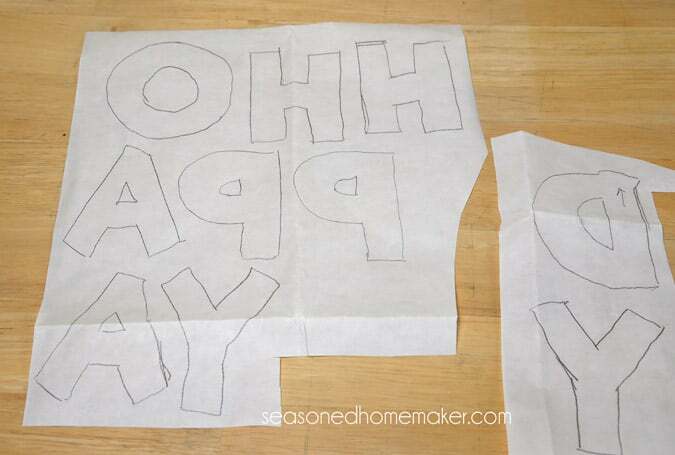 Once completely cooled, cut out the traced letters. Lay out your letters onto your background fabric. In order to keep my lettering straight I used a large cutting mat and quilting rulers. I carefully placed my letters onto the background fabric and pressed them in place. 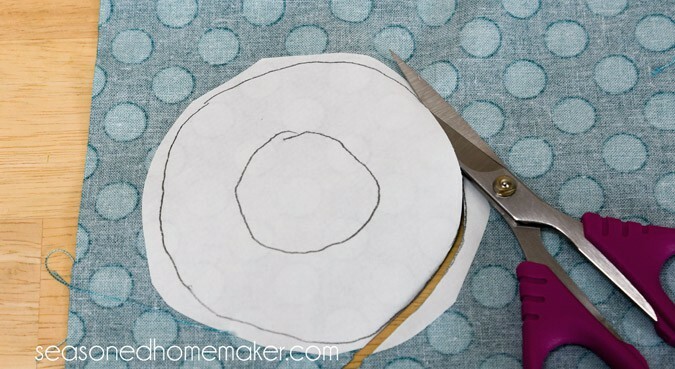 I used a piece of white-ish linen for my background fabric and cut it into a fat quarter size of 18″ x 22″. Because the linen is so ravel-y I serged the edges. If no linen is available, a lightly patterned fat quarter will also work. I used the linen because I wanted to try quilting on it. There is this slight natural sheen on the linen that was unknown-to-me-before-this-project. We’ll just call that a blind-squirrel-finds-a-nut moment. Stitch down the lettering. I used a straight stitch and black thread to secure the lettering. I think the black thread makes the letters stand out a better. 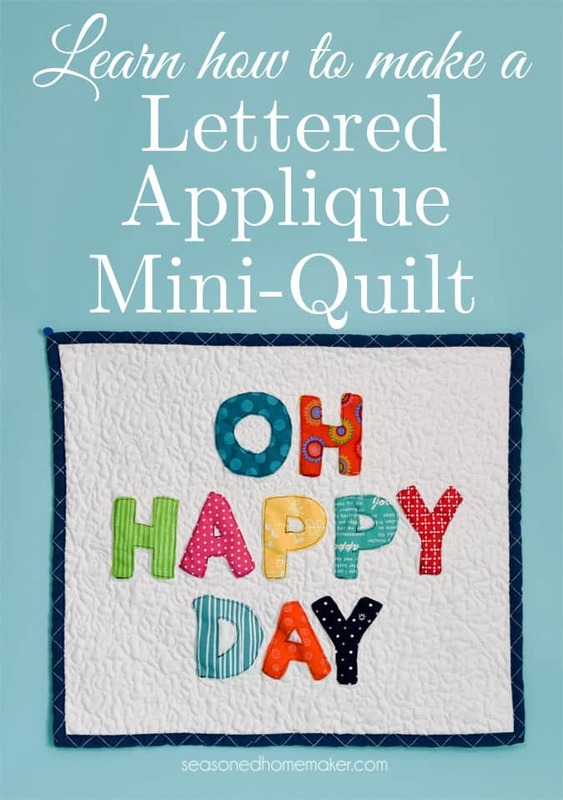 But this will ultimately be determined by the wording on your mini-quilt. For some reason unknown to me I didn’t get a photo of the quilt sandwich or my quilting. This photo will have to do. I used a similar fat quarter for backing and a Hobbs Heirloom Fusible Batting scrap. Small projects like this are ideal for fusible batting! For my free motion machine quilting I chose to do a small scale stippling and (for the first time) I feel like my machine quilting isn’t an embarrassment. The quilt is bound with a scrap of fabric from my stash. The project was fast and easy and I love the feeling I get every time I look at it. 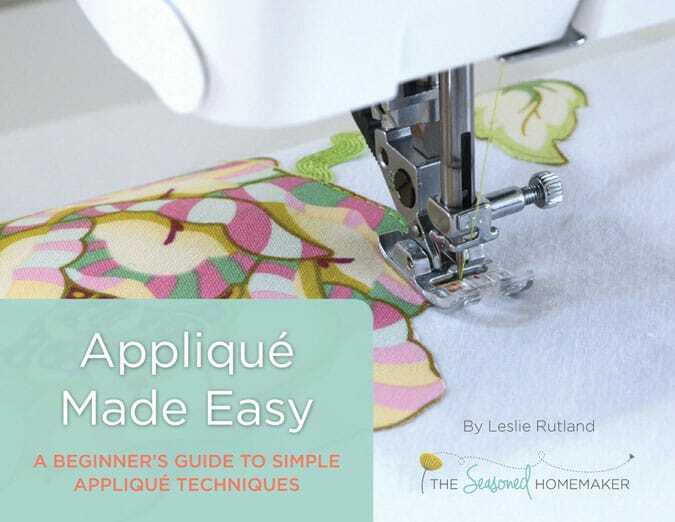 I’ve included this short video that gives a brief overview of applique. You’ve reminded me of the old saying, “When you love what you do, you never work a day in your life.” Keep us posted on your gardening ideas. I love gardening too and hope to keep adding posts occasionally. Oh how I can identify with this delightful post. 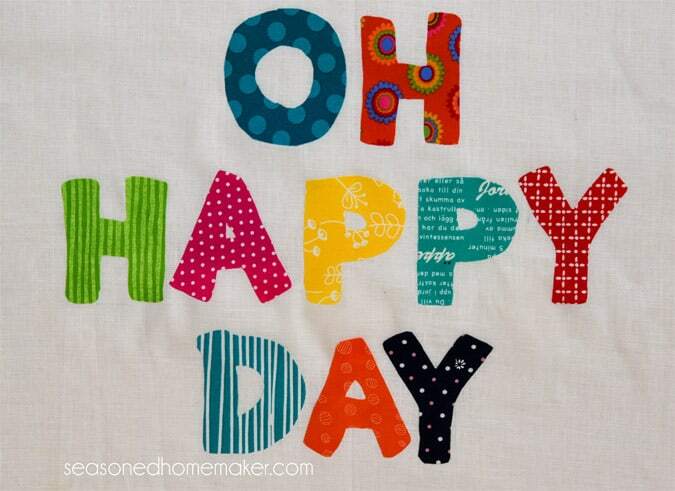 Difficult “life” has been happening all around me for the past few months and sewing is tuly “my happy place”. It brings me joy and contentment. It is the one thing I have control over. The joy is multiplied as usually what I sew is given as a gift. As always thanks for a wonderful post. Great way to start my new year. Leslie, this project is lovely! This is definitely on my to-do list. Thanks so much. Happy New Year! I loved this post! I”m new to your blog and have really been enjoying it. Thank you for sharing! I came via a party here. Had my daughter on my lap, going through the party entries. She was fascinated by your lettering and message (she is 2 and a half) so, I clicked here. She loved it and kept saying “‘appy day” and examining the photos. Leslie, I agree. Sewing is my passion and joy. I sewed all my Christmas gifts so I was spending lots of time in my sewing room. Honestly, it was heavenly! I can’t wait to get back there. It sure is hard to carve out the time. By the way, for Christmas I made some of your items.I was especially proud of the napkins with mitered corners – a new skill for me. I also, on account of one of your posts, gave myself an edge joining foot for Christmas. I am very excited to try it out. There are just too many wonderful things to make and not enough time! Thank you so much for your blog. Keep teaching us about sewing. I value it! This looks so gorgeous! I recently made something like this on a cover duvet I made for girl for Christmas! I thought about just sewing close to the edges but I end up making a zig-zag all over the edges. I actually love how it looks without the zig-zag. I might do it again soon! It sounds really cute. I considered using this wave stitch on my serger. I may have to do another one. Thank you for this “easy-looking” project. It may contain the answer to where I am stuck at in quilting a twin-size quilt . What happened is that I chose to be original with a quilt design, without making a complete plan. I have ended up with an awesome almost-square rectangle that is lacking in length, particularly, as well as sides, in design. I didn’t want to add too much plain color to complete it, and have not been able to design something satisfactory with the left-over pieces. Am wondering what to do. Perhaps a series of words, cut out of design fabric and stitched on plain fabric, might be a great answer. Any how, I do appreciate your well-stated and doable solutions. Leslie, you never cease to amaze me with all your fun and easy ideas. Wish I could make EVERYTHING I come across in the sewing,embroidery and quilting worle. How fascinating!! How can anyone get “bored”? Thank you for your fantastic posts! !